This structured, formidably-endowed, deep ruby/purple-colored, full-bodied, super-rich wine exhibits notes of toffee, truffles, and abundant blackberry, cherry, and currant fruit. It cuts a large swath across the palate, and possesses copious but sweet tannin as well as a chewy, muscular mid-palate and finish. This is a compelling effort from one of the great vineyards of Pomerol. Anticipated maturity: 2006-2030. This wine is rich, full, and prodigious. A black/ruby color is followed by knock-out aromatics of grilled meats, licorice, black cherries, and blackberries. Backward, with high tannin, awesome concentration, a penetrating, layered feel in the mouth, and enormous weight and length, it will require 7-10 years of cellaring, and should keep for 30-35 years. It is a superstar of the vintage! Anticipated maturity: 2008-2030+. Let me make it crystal clear - readers have to go back to 1961 to find a Trotanoy of such exhilarating power, richness, and potential complexity. There are 2,800 cases of this black beauty. Harvested at the perfect time, Trotanoy's 1998 boasts a saturated black/purple color, as well as a gorgeous nose of truffles, licorice, black currants, overripe cherries, cedar, and coffee. Amazingly full-bodied, with fabulous concentration, and firm yet sweet tannin, this massive wine will require 8-10 years of cellaring. Those seeking a Trotanoy made in a forward 1995 or 1990 style, will need to re-calibrate their palates when tasting this blockbuster. Anticipated maturity: 2008-2025. The Trotanoy 1998 has Cabernet Franc dominating nose, more than I have encountered on any other bottle previously with bell pepper, tobacco, allspice and sandalwood dried herbs, almost Cote-Rotie-like in character. With further aeration, there is just a touch of chimney soot. The palate is medium-bodied with firm, very dry tannins, again, the Cabernet Franc imparting the leafy, dry, almost herbaceous character with a slightly bitter finish. Intriguing. Tasted April 2011. Tasted at the Pomerol off-line at The Ledbury. 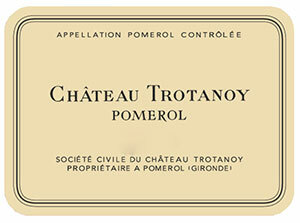 This is a great Chateau Trotanoy. It has a lucid, youthful hue. The nose is bashful at first but then explodes in the glass with dark cherries, iodine, wild hedgerow, liquorice and violets and before long…you are hooked! The palate is full-bodied with ripe, saturated tannins and great density; you can feel the weight of this wine in the mouth. The oak is now fully integrated with dark cherries, tobacco emanating from the Cabernet Franc that has more to say towards the grippy finish. There is a sense of this being a “compact” Trotanoy, one that I think will be even greater in another 10-12 years. Drink 2013-2035. Tasted September 2010. Just showing slight signs of maturity on the rim. The nose is just a little more open but then ripe black cherries; iodine, liquorice and date scents begin to slowly emerge. The palate is full-bodied, much fleshier than the 2000, very supple and feminine with a lovely velvety texture. Well-integrated oak, sweet red cherry, redcurrants, a touch of burnt toast and freshly rolled tobacco on the middle. Very powerful with great depth and persistency on the finish, this is a great Pomerol that should be drinking a little earlier than the 2000. Drink 2012-2035. Tasted May 2007.